The most famous secret location in Britain has restored more Codebreaking buildings, with D J Willrich Ltd providing AV for a light-touch interpretation that helps take the site back to its heyday. 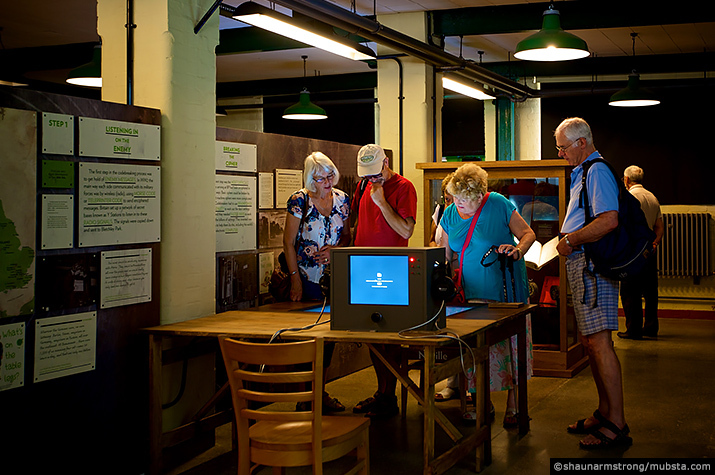 Visitors arrive into Block C, location of the punch card library during WWII and derelict since, but now a vibrant visitor centre. 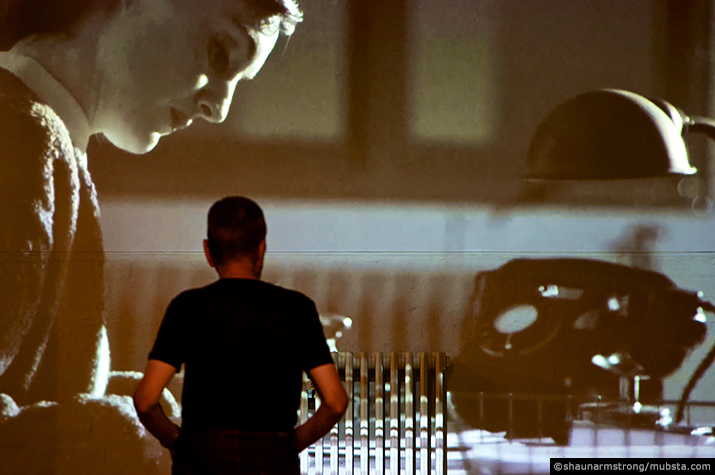 There, two synchronised projections introduce the story of Bletchley Park. Further projection shows the developing map of Bletchley Park as it grew. 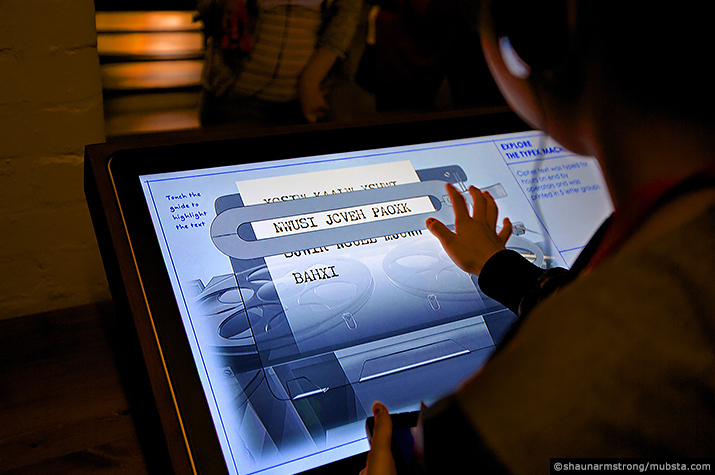 After using a rotary dial connected to a touch screen interactive to tune in to Morse code signals, visitors use other touch screen interactives to follow the steps of the Codebreakers, breaking and making codes. Outdoors, there are 13 ground speakers and 8 high level speakers cunningly hidden in trees. These play a soundscape of the code breakers and couriers coming and going, as well as at play, with a game of rounders, ice skating and more. Occasionally a B52 or Spitfire will ‘fly’ overhead – leading visitors to get their cameras out in hope of photographing it! Carefully installing a speaker into a listed tree was all just part of the work. In Huts 6 and 3, projectors are hidden in filing cabinets to project Codebreakers at work in the offices, while ambient audio plays from hidden speakers. The projections are straight onto the native walls, part of the ‘light touch’ approach. Veterans said the feeling was just how they remembered it. 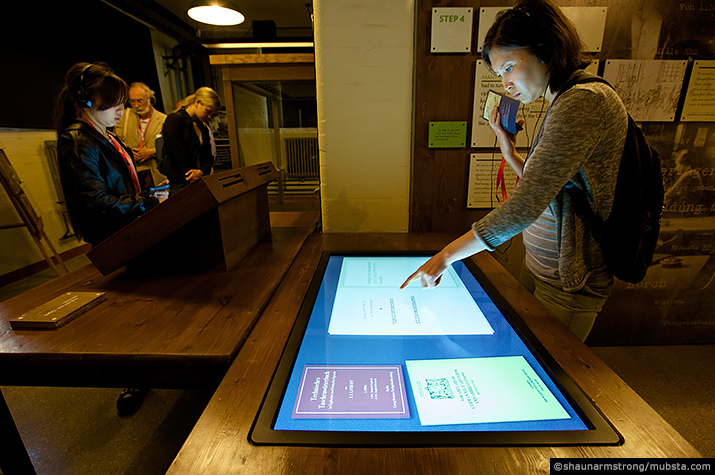 Hut 8, where Alan Turing’s office was, holds further touch screen interactives showing the work done there, as well as 4 touch tables with games about probability.